The 1990s saw further company changes at Filton. With the collapse of the Soviet Union the Cold War ended. The collapse contributed to one of the major trends of the decade, the increase of globalisation and of world markets. The decade also saw the rapid growth of the internet, the birth of Britpop and the first Gulf War. Rolls-Royce Leavesden closes and UK helicopter engine business moves to Patchway. First B2 Stealth bomber is delivered to the USAF. New balloon distance record set by Steve Fossett. ASRAAM (Airborne Short Range Anti Aircraft Missile) delivered to RAF. Rolls-Royce Defence Aerospace established at Filton. British Aerospace merged with GEC’s Marconi Electronic Systems business; BAE Systems formed. NATO embark on systematic bombing campaign against Serbian forces in Kosovo. 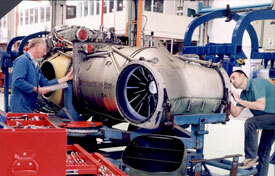 Pegasus undergoing checks (Rolls-Royce plc). Search the Aviation Archive for images of West of England aircraft in the 1990s.